In case you haven’t noticed, this year was the Diamond Jubilee of Queen Elizabeth II, and a whole host of museums, galleries and other institutions have eagerly capitalised on a resulting spurt of public interest. A spurt of interest, thankfully, in not just the Queen herself or the monarchy, but in Britain, Britishness and all things British, helped no end by a certain large-scale sporting event that took place in London recently. I say ‘thankfully’ because this has given rise to exhibitions that, while all in some way having the monarchy or Britain during the past 60 years as a focus, have been richly varied in subject matter – from the National Maritime Museum’s brilliant ‘Royal River’, looking at how the monarchy used the River Thames to display its power over the centuries, to the Victoria and Albert Museum’s equally brilliant ‘British Design: 1948-2012’, charting British design innovation from the postwar period (the last time London hosted the Olympics, when the Queen began her long reign) to the present day, from architecture and road signs to fashion and music videos. Daily Mirror journalist Tony Parsons wrote in the aftermath of the Olympics that ‘London 2012 held up a mirror to our nation and we were rather surprised to discover that we liked what we saw’. I’d like to think that some of the capital’s exceptional exhibitions over the summer have played a part in that re-examination of Britishness, for Royalists and Republicans alike. 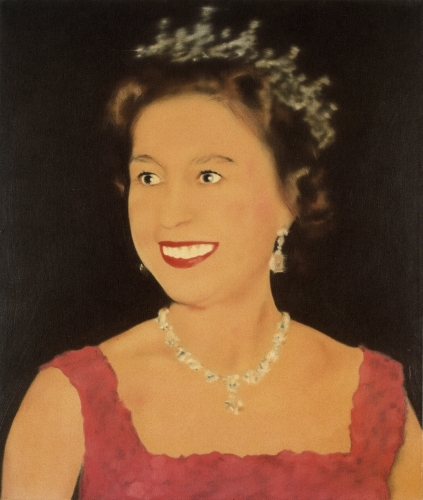 Needless to say, Her Maj is well and truly the principal focus of the National Portrait Gallery’s The Queen: Art & Image. 60 portraits of the monarch, one for each year of her reign, encompassing painting, photography, sculpture and even a couple of 3D holograms. Never before has a reigning monarch been portrayed in such an electic variety of styles, mediums and forms, but then again no monarch has ever reigned over such a period of social and cultural change in their realm. Above all else, this exhibition focuses our attention on the unique historical and cultural space that Queen Elizabeth II occupies. 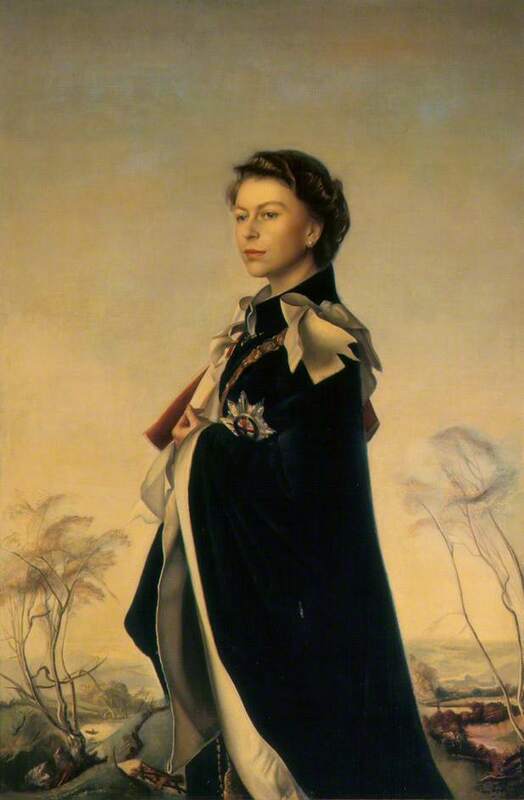 The first room of portraits are from the first decade of the Queen’s reign, the 1950s, and unsurprisingly she is depicted in a magisterial, resplendent manner, from the deep symbolism of Cecil Beaton’s coronation portrait to the chivalric, mystical romanticism of Pietro Annigoni’s painting of the queen in her garter robes (right). But even this early on in the exhibition is a sign, an ominous one you might say, of things to come. Remote and otherworldly the monarch may still have seemed in the 1950s – “gazing at the world from a position of isolation”, as Annigoni set about painting her – but the fact that her coronation ceremony in Westminster Abbey was televised and watched by an audience of millions was hugely significant. Much of the establishment, including the Prime Minister Winston Churchill, had strongly opposed what they saw as public intrusion on what was a profoundly serious and deeply religious ceremony. It would mark the start of what would come to define the reign of Elizabeth II – the delicate and difficult act of balancing formality and familiarity. By the 1960s – the second room – the idea of the traditional royal portrait appears to have gone out of the window already. 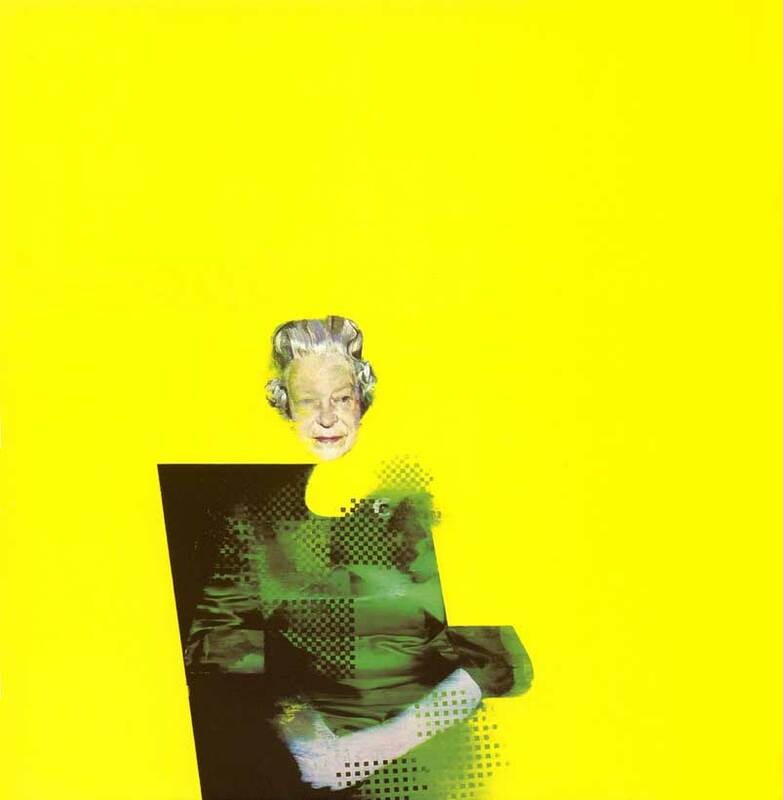 From that point on artists began to play with the idea of the Queen’s image as purely artifice, painting and printing her exaggerated, distorted and fragmented (see Gerhard Richter, left, Andy Warhol and Justin Mortimer, below). The boundary between what was a portrait and what was a caricature became increasingly blurred. Meanwhile, it was in photographs that the ‘real woman’ behind the image of the monarch began to be revealed. Indeed, it is perhaps a perfect demonstration that I am a product of the age in which I was born that the images in this exhibition that I found the most interesting were those that were the most revealing, that nudged their way closest to the point where the Queen ends and Elizabeth Windsor the human being begins. In the age of mass media in which we live, we demand and we expect to see our Queen’s ‘human side’, recognise her ‘normalness’, and – dare I say it – ‘relate to her’. Three images really struck me in this regard, all photographs of a somewhat candid, spontaneous nature. One is of the Queen with her sister and her mother, on the occasion of the Queen Mother’s eightieth birthday. It is as ‘human’ as I have ever seen the Queen in photograph, herself and Princess Margaret standing either side of their mother, leaning into shot over her shoulder in a way that three teenagers might be snapped off-the-cuff by a friend at a party. Another is of the Queen in 1992, her self-confessed Annus Horribilis, in an altogether different state of mind. In that year three of her children’s marriages fell apart and Windsor Castle caught fire. In Dylan Martinez’s photograph she stands, watching the castle burn alongside a concerned-looking fireman, in a state of distress and despair. Finally, there is a striking image by Chris Levine, a photograph of the Queen with her eyes closed, apparently captured by accident when the Queen was momentarily resting her eyes between the photographer’s multiple long exposures. Wearing the Imperial crown, the ultimate symbol of Royal power she may be, but with her eyes closed we are somehow reminded of her mortality and her humanity. Levine’s presentation of the work as a hologramitical image only adds to its haunting, ghostly quality. In this regard, I find it difficult to know what in this exhibition, if any, is great art. I also don’t feel that this exhibition teaches us anything we didn’t already know about the Queen. But I think that coming to terms with the enormous challenge that has confronted all the artists that the Queen has sat for, and seeing how different all their various attempts to get to grips with her Majesty have ended up, is the real point of the exhibition. Basically, it’s about the artists, and the British public’s shifting attitudes and perceptions, and not about the Queen herself. Even for those who don’t think either the art in this exhibition or the Queen herself is in any way great, or worth celebrating at any way, it is hard to deny that the curators have done a great job of making sure there is certainly plenty of interesting art here, and there are a few surprise packages (such as Hew Locke’s ‘Medusa’, a sculpture built from old junk, and Hiroshi Sugimoto’s strangely unsettling photograph of a waxwork of the Queen). However I would have liked to have seen more of the assortment of objects – from satirical cartoons to banknotes and stamps – that fill a small cabinet in the centre of one of the rooms. After all, charting the way that her image has been used outside of the realm of ‘portrait’, official or unofficial, is an equally interesting story to tell, but in this exhibition it is relegated to something of a footnote. 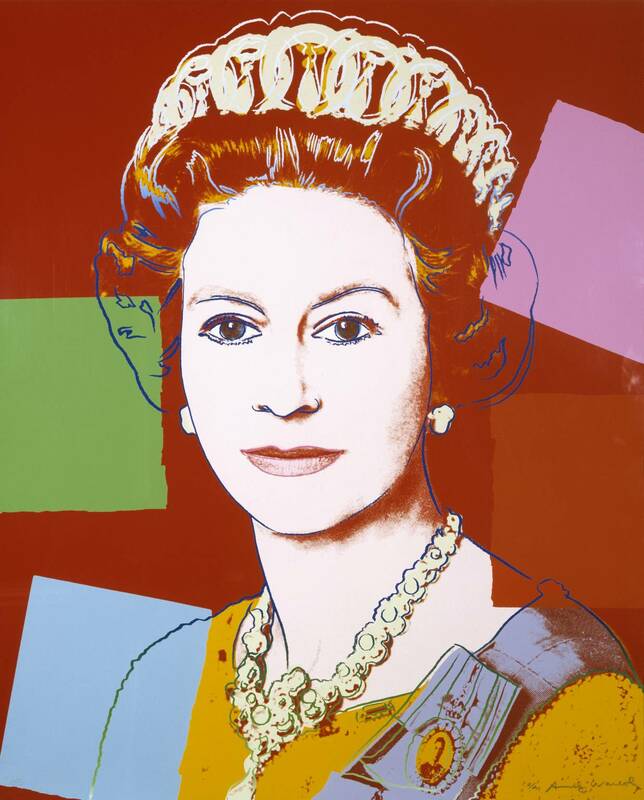 The Queen: Art & Image runs at the National Portrait Gallery until 21st October, with tickets priced at £6.60 (senior citizens £6.05, other concessions £5.50). The exhibition was prominently featured in a BBC documentary aired in June now on YouTube ‘How to Paint A Queen’, a Culture Show special presented by Alastair Sooke about the history of depicting monarchs, that I wholeheartedly recommend watching whether you get round to visiting the exhibition or not. Tags: Andy Warhol, Art & Image, Art & Image Review, Britain, Britishness, Cecil Beaton, Chris Levine, coronation, Dylan Martinez, Elizabeth II, exhibition reviews london, exhibitions london, Gerhard Richter, Henry VIII, Hew Locke, Hiroshi Sugimoto, Justin Mortimer, National Portrait Gallery, Olympic Games, painting, photograph, Pietro Annigoni, portrait, power, queen, Queen Mother, The Queen, The Queen Art & Image Review, Will Self, Windsor Castle, Winston Churchill. Bookmark the permalink.